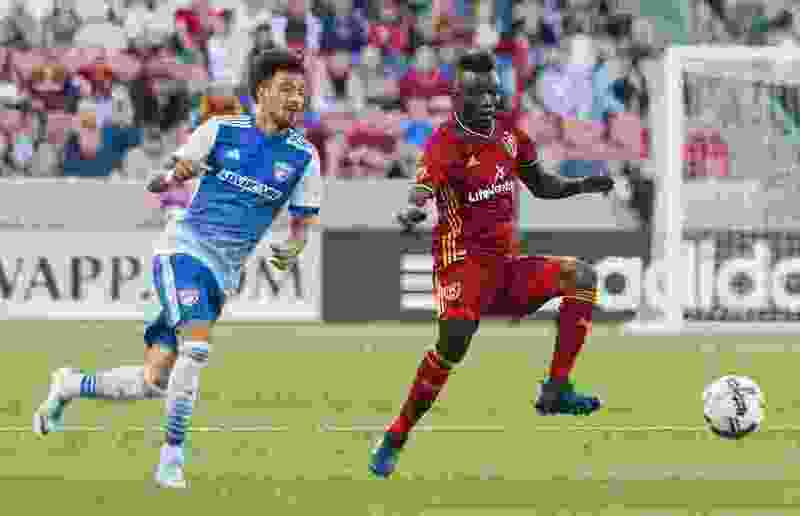 Club declines midfielder’s option; he says he wants to remain in the U.S.
Michael Mangum | Special to the Tribune FC Dallas forward Maximiliano Urruti (37) pressures Real Salt Lake midfielder Sunday Stephen (8) during their match at Rio Tinto Stadium in Sandy, UT on Saturday, May 6, 2017. After three seasons with Real Salt Lake, midfielder Sunday “Sunny” Stephen is leaving the team. Stephen was told by management that his option would not be picked up for the upcoming 2019 season, he told The Salt Lake Tribune late Monday. RSL will officially announce all of its contract options Monday. The players had their exit physicals and interviews last week in the office of the team’s head physician. Stephen said he already knew before his interview that he would not return to the team, but was waiting for the right time to announce the news. But a post on Marcelo Silva’s Instagram page inadvertently let the news out. 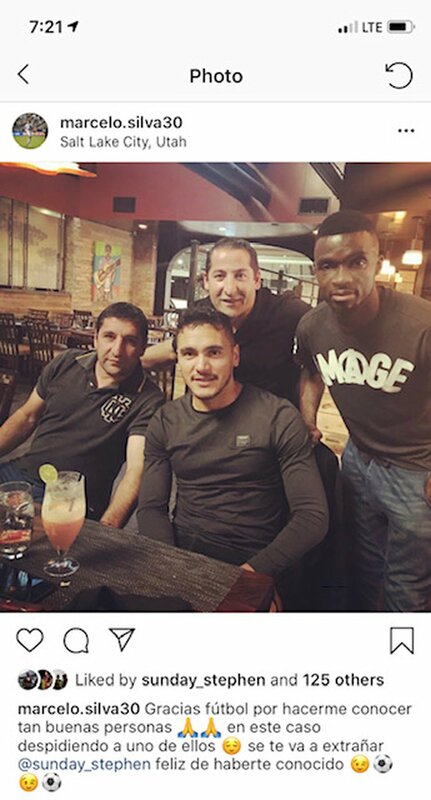 The post was a photo of Silva, Sunny, RSL equipment manager Alex Caparelli and an unknown man having dinner at a restaurant. Silva wrote in the post’s caption, which was in Spanish, that soccer gives him the opportunity to meet good people, and he was saying goodbye to one of them. Silva was referring to Sunny. That Instagram post has since been deleted. A screenshot of Marcelo Silva's Instagram post implying that Sunday "Sunny" Stephen is leaving Real Salt Lake. Stephen’s departure from the team stems from a contract dispute that has gone on since the 2017 offseason. Since that time, Sunny said he has asked general manager Craig Waibel, coach Mike Petke and even former coach Jeff Cassar for a salary increase. When it became clear Stephen would not receive the salary bump he wanted, he told the club not to pick up his contract option for his third year, which he just completed. But much to his chagrin, the team did just that, which led to Stephen staying in Spain and not reporting to training camp at the start of the 2018 season, he said. On advice from his agent, he eventually decided to report to the team. MLS fined him for not reporting on time, he said. Stephen continued to feel he was underpaid, expressing his unhappiness over his contract to RSL coach Mike Petke at one point this past season. “It’s either I’m so bad to earn such money or — I don’t understand,” said Stephen, whose total compensation this season was $288,000, per the MLS Players Association. Waibel declined to comment when reached by The Tribune. Stephen said Petke told him at the start of the season that he wasn’t going to get any playing time because other players were preferred at his position. Stephen was also listed as an unprotected player in the expansion draft before the 2018 season. However, he managed to work his way into the lineup and started 16 of the 23 games in which he played. In his entire career at RSL, Stephen scored a goal and had three assists in 59 regular-season games and 49 starts. He appeared in three total playoff games — one in 2016 and two in 2018 — and started in two of them. Stephen said he would like to stay in the United States to continue his soccer career. Stephen said he made friends and bought a home in Utah. But he seemed content parting ways with RSL. “I’m happy that I’m leaving,” Sunny said.